The Big White Wall project at Central Saint Martins, now in its second year, gives a current student the opportunity to work on an unprecedented scale, by covering a 7m x 30m wall in the heart of Central Saint Martins. This fantastic project was devised by the Dean of Academic Programmes, Mark Dunhill, and is fully supported by Cass Art, Winsor & Newton and Liquitex. Second year BA Fine Art student, Matthew Wang, has been announced as the winner of this year's Big White Wall Competition. His bold, colour-blocked design impressed the judges, and he was chosen out of five shortlisted candidates to bring his vision to life in UAL's impressive Central Saint Martins building. Can you tell us a bit about your design and its inspiration? The wall is split into seven segments, or colour groups, flushing from the left to the right, with each segment proportionate to a scaled smartphone screen. Six of the seven segments reflect different regions of the world e.g. USA, UK, Saudi Arabia, China, and the remaining central segment represents the search engine, Google. Within each colour group, the area is further broken down into individual blocks of colour; with each block representing an image place-holder, similar to that of an image search on an internet search engine. Each individual block of colour in this case corresponds to an actual image found from the top of a Google image search for a particular geographical region, that is, the highest priority images, as generated by Google’s search algorithms. The way a Google image search decides on a place-holder colour is by filtering pixel information from the actual image e.g. Hue, Saturation, Pixel Frequency. This method of filtering images becomes peculiar when these colourful image queries of different geographies are placed side-by-side. Enlarged to this scale, each colour also carries different meaning and weight, making for an interesting interrogation of modern imaging, and the way images are created, disseminated and consumed today. How are you finding working to such a large scale? There's a new set of challenges and rewards attached to working to this scale. Time management and logistics are the most complicated areas to deal with. No matter how much I try to predict and plan around problems, unexpected things always crop up. For instance, little tasks like carrying paint up and down the scaffolding takes a surprising amount of time, which I didn't factor into my schedule. On the flip side, creating something on a large scale opens up a whole new conversation about the work, which is really enriching. Having to manage many different stakeholders has definitely been the biggest challenge. On a project that involves so many parties: university management, tutors, sponsors, student helpers, health and safety advisors, it takes a lot of planning to keep everyone informed and satisfied. What materials are you using to create the piece? I tested out smaller versions of the design in print, but felt that the most appropriate medium, given the budget and time frame, was paint. I am using acrylic paint supplied by Cass Art and Liquitex, and mixing colours to accurately match the on-screen hues of the Google images. Using a range of colours, textures and mediums, I’ve managed to achieve the kind of opacity and finish I want. High pigment tones look great with just one coat of paint, but other shades such as crimsons and yellows sometimes take up to 5 coats before appearing consistent. What other work do you make? I work predominantly in video, performance and photography, and this is actually my first foray into painting! I'm interested in psychogeography as a theme for my work, in particular how cities are built and managed, and how this affects those who live in them. While aesthetically different to much of the artwork I produce at university, I see this piece as strongly connected to the general themes and ideas I explore. If I had access to the necessary resources I would definitely undertake another similar project. There are things that I would do differently if a project like this were to come my way again, and I’d be better at handling the challenges. On the whole, it was a great learning journey; especially getting to meet new friends and sharing this experience together with them - that, I’d do again and again. 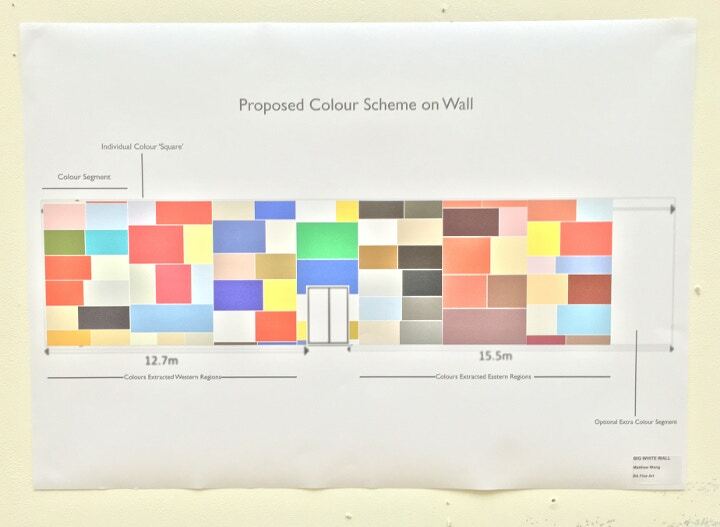 The Big White Wall will be presented to Central Saint Martins' students and staff members in March 2016. Please note, at present this artwork is not open for public viewing. Read more about the Big White Wall project, and its previous winners here. Shop for acrylic paint online at Cass Art.